We’d love your help. Let us know what’s wrong with this preview of Sing a Song of Seasons by Fiona Waters. To ask other readers questions about Sing a Song of Seasons, please sign up. Wow. This is truly an undertaking but well worth your time. There is a poem for everyday of the year along with adorable illustrations. A collection to go back to time and time again. Thank you to my library colleague to have thought of me by bringing this beauty to my attention. Such a beautiful and joyful book. Highly recommend this to readers young and old! This is a museum of an oversized picture book with a brief nature poem for each day of the year. Gorgeous! As I read, I was taking mental notes of the number of women and BIPOC represented and it wasn't many. There are also a lot of "anonymous," many of which should be "traditional" I think. It made me think about the logistical hurdles involved in assembling a collection like this. You can't just reprint anything, so were they bound by the publisher's catalog/public domain/etc.? I ponder this not to make excuses for the editors & publishers to just prin Beautifully illustrated poetry collection. Excellent selection of nature poems, paired with outstanding illustrations. Oh my goodness, this book is gorgeous. I look forward to bringing it out everyday in my homeschooling. The poetry is wonderful, the illustrations are beautiful. I'm in awww!!!! Of this book. Absolutely delightful, if not a bit cumbersome. A must-own for any lover of children's books, nature, and poetry. Sing a Song of Seasons is a big, beautiful book. As the subtitle says, it’s a collection of nature poems for each day of the year. It’s massive, bulky, hefty and long, but it’s also shiny, colorful, engrossing and gorgeous. The sheer size of it is daunting at first, but flip to any random page (perhaps the date of the day you happen to pick it up) and after an initial tentative dip you’ll find yourself wading deeper and deeper into its enchanting combination of words and pictures. The lovely ill Sing a Song of Seasons is a big, beautiful book. As the subtitle says, it’s a collection of nature poems for each day of the year. It’s massive, bulky, hefty and long, but it’s also shiny, colorful, engrossing and gorgeous. The sheer size of it is daunting at first, but flip to any random page (perhaps the date of the day you happen to pick it up) and after an initial tentative dip you’ll find yourself wading deeper and deeper into its enchanting combination of words and pictures. The lovely illustrations are perfectly paired with the carefully curated poems, and most of the poems are brief enough that you can breeze through large sections before you realize how many pages you’ve read. And yet the scope is such that you can’t take it all in in one sitting. It really is a stunning work. Read it alone. Read it aloud to others. It would be a great way to instill a love of poetry and nature in the young folks in your life. This is a coffee-table-worthy book that deserves daily living space with a family or classroom like yours. 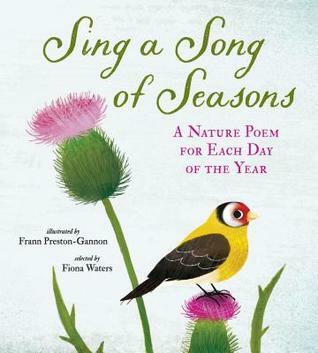 SING A SONG OF SEASONS: A NATURE POEM FOR EACH DAY OF THE YEAR offers poems collected by Fionna Waters and pages delightfully illustrated by Frann Preston-Gannon. The unifying theme of nature provides the focus for these selected poems, a balanced blend of all-time classics (including ones by the prolific Anonymous) and contemporary creators. The poems are organized chronologically and arra This is a coffee-table-worthy book that deserves daily living space with a family or classroom like yours. SING A SONG OF SEASONS: A NATURE POEM FOR EACH DAY OF THE YEAR offers poems collected by Fionna Waters and pages delightfully illustrated by Frann Preston-Gannon. The unifying theme of nature provides the focus for these selected poems, a balanced blend of all-time classics (including ones by the prolific Anonymous) and contemporary creators. The poems are organized chronologically and arranged following monthly, date-labeled tables of contents. The back matter is an invaluable resource (author index, title index, and first line index). The language is enhanced brilliantly by the remarkable illustrations throughout. This book is not really a picture book but more of an anthology of poems. Beautiful illustrations couple poems laid out for every day of a year. There are also there different indexes in the back - poets, poems, and first lines. This beautifully illustrated big sturdy book is filled with some of my favorite poems as well as many new ones. It's fun to look up the birthdays of your family and friends to see what poem has been chosen for their special day. There's a handy index at the back with poets, titles, and first lines listed. Great for all ages with delightful illustrations of wildlife throughout. This would make a good holiday gift for a kid who wants to read a poem each day of the new year. It would also make a lovely coffee table book. The poems that were selected aren't anything that's really new, special or amazing but the scenic illustrations work really well, like a calendar. An anthology, lovingly illustrated, of 365 poems for children from Nursery Rhymes to Shakespeare and everything in between. This would make a great addition to bedtime routines. I wish it had been around when my kids were young. Gorgeous and enormous. A lovely collection. Lovely illustrations are paired with a fine poem for each day of the year. This is a a nice book to own. The illustrations are great. I likes that the author included poems by different poets. Beautiful collection of poems and art. Beautiful illustrations correspond to poems marked for every day of the year. A variety of authors are used, though some feature more prominently than others. A great daily read aloud for children. An absolutely wonderful poetry compilation, beautiful illustrations and lovely poems!